"That damn show! Watched the mid-season finale (when did that become a thing??) of This Is Us with my lunch today. Cried like a baby, not once but twice! And laughed some in between. If you've been looking for a replacement for Parenthood, this is a good one!" I thought that would make a good intro to my review today. 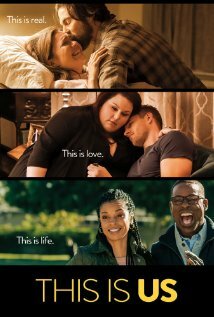 I've been watching NBC's This Is Us, a new family drama, all season, and I absolutely love this show that often makes me laugh and cry in the same episode (much like Parenthood used to!). There are a lot of potential spoilers here, so I will just try to tiptoe around the plot and set-up and only tell you the basics. In the first episode, we peek in on the lives of several different people who are all turning 36 on the same day. There's Jack, whose wife, Rebecca, is pregnant with triplets. She goes into labor on his 36th birthday, and they rush to the hospital. We meet Kate, a woman who is struggling with her weight, to the point that she has to put Post-Its on her 36th birthday cake to remind herself not to eat it before the party. Kate goes to a weight loss meeting and meets Toby, a friendly and funny guy. Meanwhile, Kevin is also turning 36 today. He's an actor on a very successful TV show called The Manny, and is celebrating his birthday with not one but two beautiful women...but he is clearly unhappy. We also meet Randall, a black man working in a sleek office, dressed nicely, and clearly successful, as his office staff brings him a birthday cake. Randall has tracked down his birth father, who left him at a fire station as a newborn, and goes to his home to confront him. All of that happens in the beginning of the first episode. They are each interesting characters on their own, but the magic happens as you find out how their lives are interconnected at the end of that first episode (I admit, I was a little slow and didn't completely "get it"until the middle of the second episode!). Throughout this first season, we see Kate, Kevin, and Randall both as children growing up and in their current adult lives, as each of them struggles with his or her own issues. We also follow Rebecca and Jack. I used the word "magic," and I think that is apt because there's a special kind of alchemy here that pulls you deep into these people's lives, brings them alive on the screen, and makes you care about them and what happens to them. It's one of those rare shows that reminds that everyone is connected. The comparison to Parenthood is also appropriate because it is a family drama, and it pulls at your heartstrings in every single episode, but not in a saccharin or maudlin way. These two shows are the only ones I can think of where almost every episode makes me both laugh and cry! I've heard people who were determined not to like the show nevertheless get pulled in and moved by it. It's really something special. The acting is excellent across the board, and it truly is an ensemble cast, with no one person more important than the others. I didn't mention the actor's names because most of them were unfamiliar to me. Mandy Moore plays Rebecca (which I didn't realize until it was pointed out to me). Jack is played by Milo Ventimiglia, who was unfamiliar to me as he appears in the show, with a mustache, but who I now recognize from other TV shows like Heroes and Gilmore Girls. Many of the other actors are less familiar but are all really great on this show, especially Sterling K. Brown as Randall. Both Mandy Moore and Chrissy Metz as Kate snagged Golden Globe nominations this week for Best Supporting Actress, and the show itself was nominated for Best TV Drama. This is Us airs on NBS on Tuesdays. It just finished up for the holidays but will return with new episodes on January 10. In the meantime, you can catch up on all of the first 10 episodes On Demand (all episodes are available & should remain that way for a good while) or on the NBC website (all 10 episodes are up and free). On Amazon, the first episode is free and the other 9 are $1.99 (or the full first season for $9.99). Have you seen this unique show yet? What TV shows can make you cry? I fell in love with this show. Excellent!!!!! My opinion all the actors involved should pick up awards. Can t wait for the return. Me, too, Lucy!! We'll see what the Oscars bring! It's Monday 12/26! What Are You Reading? It's Monday 12/19! What Are You Reading? It's Monday 12/12! What Are You Reading? It's Monday 12/5! What Are You Reading?